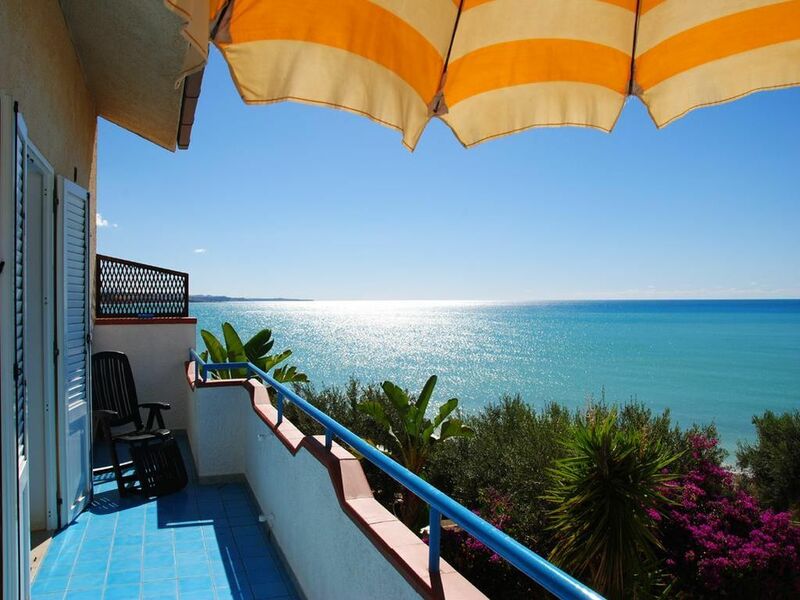 Calm and cosy apartment facing the sea, mq 120, on the first floor of a recently restructured villa, in Lumia Sciacca Terme city, only 50 mtr from the beach, with sea view terrace and independent entrance. Comfortable and very cured, the apartment has a car place and an equipped for open air barbecue. Free WI-FI connection. Lumia is only 5 km to center of Sciacca, one of the oldest towns in the island that conserves artistic works of notable interest especially of the medieval and baroque periods, there are excellent modern thermal facilites. - 2 Bathroom with shower etc. - Final cleaning: once per object Costs amounting to 75 EUR (Mandatory). - Pet: once per pet Costs amounting to 20 EUR (optional). - Electricity: per object and week Costs amounting to 145 EUR (Mandatory). - Cot for children: per person and week for rent at a price of 20 EUR (optional). Sciacca is a small city in the south-western coast of Sicily. Sciacca Terme is located in a favourable touristic position, for it is beetween the doric temples of Selinunte, and the Greek ones of Agrigento. Well known to the Latins, who colonized Sciacca and called it “Thermae Selinuntinae”, Sciacca has acquired importance for its sulphureous waters and natural vaporous caves of Monte Kronio, a 400 metres high hill which dominates the city. Sciacca was founded in VIIth century b.C. and the architecture of its historical buildings shows the presence of baroc and medieval influences. Sciacca is still surrounded by imposing stony walls and historical doors, has a still existing medieval castle and it is full of churches and impressive Norman palaces. All these features makes Sciacca Terme become an island in an island, a place to visit. To stay. To love. (once per person, vorhanden 5 EUR). Air condition (per property and day, included in price 10 EUR). Cot (per person and week, according to consumption 20 EUR). Cot for adults (per person and day, to be done by tenant 7 EUR). Parking facilities (per property and day, included in price 0 EUR). Visitor's tax (per person and day, to be done by tenant 0.5 EUR).